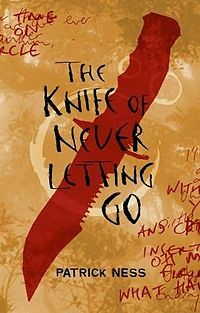 The Knife of Never Letting Go broke new boundaries in teen fiction, playing with powerful language and extraordinary characters, evoking a dramatic raw setting that pit young Todd, the illiterate but brave orphan and his dog against the mad men of Prentisstown. It�s a world where all men can hear each other�s thoughts as well as the wild beasts and all are slowly going mad. Todd found Viola crash-landed on his world, an island of silence in a noisy world and together they fled ahead of the great army crushing all behind them. They are befriended, betrayed, and in the end kill to stay alive in a harsh landscape as they make their way to Haven and supposed safety. 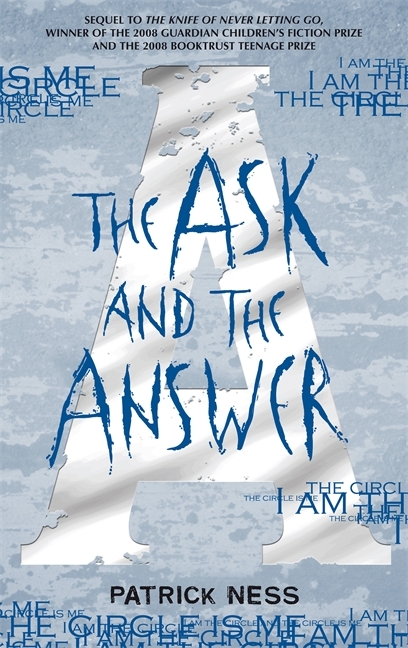 Now in The Ask and the Answer Todd finds himself prisoner of the crazed but intensely clever and evil Mayor Prentiss who has conquered all before him and now calls himself President. Viola is shot, possibly dying and the Mayor plays Todd like a fiddle, knowing he�d do anything for the life of Viola. Anything at all. This is a fantastic world � the Wild West reborn in madness � men versus women. Women can hear noise but they don�t share it, they can be private and men are frightened of them for they cannot hear their thoughts. Mayor Prentiss is suspicious of all women, he has a terrible slow burning hatred and he arrives in Haven with his army and sets about separating men from women, his possible goal the eradication of all the women. Viola is important to him because she is the forerunner of the new immigrant ships soon to arrive with more settlers and he wants to get to them first to control them, as he has everyone else. Viola will not submit to him and suspects his motives all the time, despite his constant protestations of innocence. She is cared for by the healers, the women in the hospitals who tend to the wounds and harbour deep resentments and rebellion. Mistress Coyle befriends Viola there, tries to train her to become a healer. Mistress Coyle has secrets of her own though and isn't sure whether to trust Viola. Viola finally escapes Mayor Prentiss and his torturers but can she be trusted? The women don�t like her for getting one of their own killed. But one has to take sides and she is a women. Viola desperately wants to reach the abandoned communication towers in the forest to warn the incoming settlers of all the terrible things that await them but it is Mistress Coyle who bombs the tower and prevents her from making contact. Todd is humiliated, never sure whether his Viola survived. No one will tell him where she is. He is made to do unspeakable things under the hateful eyes of Davy, Mayor Prentiss� son, already a proven killer. He has to brand the native species the Spackle, making them work as forced labour and then, even worse, brand the women prisoners. He submits because he cannot kill. They measure a man on how he kills in this world and Todd won�t kill, but Mayor Prentiss and his cruel son Davy are killing his very soul with each day � turning him against the women � trying every which way they can to make him betray Viola. She in turn no longer knows if she can trust Todd, even though she loves him deeply. Will they ever meet again? Will they ever forgive each other? Everything comes down to trust in this damned world and it�s in very short supply. This is a tough, action packed, grim faced torture filled sequel to Knife of Never Letting Go and it is relentless in its downward spiral of despair. Each animal is traumatised; we can read their thoughts, their anxiety for their own safety. Imagine a world where even plants wince as humans walk by. Can anyone be saved as the bombs go off? Can anyone be trusted and what strange power has Mayor Prentiss developed that he can control the men, beat the noise in their heads? I am the circle the circle is me � why is this the key to control that Todd has to learn? In a world that tolerates water boarding, it�s only natural it seeps into the mainstream in the Ask torture chamber � the place that Todd is forced to build. Stunning, brutal and shocking, one is desperate for Viola to save Todd and he her, but Patrick Ness takes no easy routes, this is coming of age in the Siege of Stalingrad or halls of Valhalla. There is no one you can reply on, everyone has an agenda and it�s all about the choices you make, fate that changes your destiny. You read with anguish and hope that their hearts can survive this terrible ordeal and yet somehow remain pure. In novel that is not afraid to play with typography spraying �Boom� across the pages as bombs go off and men die in ever greater numbers, the tension rises inexorably page by page This continues to be highly original, brilliant writing filled with vivid intense frontier people clinging to life and honour in total insanity. The Ask and the Answer is vexing and testing, this is civil war brought to horrible bloody life - yet I can�t wait for the final instalment. Meanwhile Todd and Viola will live on wounded and in pain in my nightmares. Imagine you are watching a film about the first settlers in America. Pious, hardworking farmers carving something out of a raw landscape. Notice there are no women, the men's clothes are rough and worn, understand something terrible has happened that has killed all the women and left just men and one boy and his dog. Imagine that this terrible thing, this virus that kills women has infected all the men with NOISE. Each man can hear another�s thoughts, can�t block them out at all, each man can hear every animals thoughts as well and all there is is Noise that drives men mad and reveals all secrets, so there can be no secrets and you are that boy and in 26 days you will be a man, at thirteen and then there will be no more boys. Your parents are dead, you have been raised by Ben and Cillian, the farmers who lived next door to you when you were small and they love you dearly. They give you a dog, Manchee, a dog you resent because a dog only thinks about poo and you go into the swamp to find apples and there you find something very strange, a place, something living that has NO NOISE. Imagine in this hellish life there is a mad preacher who knows the end of time is coming and somehow, no one knows how, because he is crazy, he thinks you have something to do with that and then, when you walk home, everyone can read your thoughts and they know you have found something and suddenly �even though you are still a boy and done nothing wrong, the whole village wants you dead. Ben and Cillian pack you off. You have to leave everything you know, everyone you love and �Never Come Back� and even as they are telling you Mayor Prentiss is banging on the door demanding to speak to you and you run, but you don�t know from what. All you have is a backpack, a day�s food and your mother�s diary you can�t even read and then you are back in the swamp and that where you find the impossible � a girl! And then the mad preacher Aaron is at your back trying to kill you and the girl and you have to fight back, but you are a boy and you don�t kill, but you run with this girl called Viola into the swamp and she takes you to her hiding place and you discover you aren�t living in America, you are living in hell and she has crash landed on your piece of hell and her parents are dead and she can hear your every thought, but you cannot hear hers and you have to trust her and she you, and nothing makes sense whatsoever now and your dog Manchee is the only true pure thought you can rely on and you never even cared for the dog. That�s �The Knife of Never Letting go' � the most stunning book for young adults to come out this year and is compulsive reading. Like Stephanie Meyer�s breakout novel �Twilight� that began life on the young adult shelves but is now read by anyone who ever wanted an exciting read, Patrick Ness�s �The Knife of Never Letting Go� is destined to reach a wider adult readership, like Philip Pullman's 'His Dark Materials' which could not be confined to kids. But don't go thinking this is cute, this isn't cute, ever. There is no giant bear coming to his rescue. Nothing is coming to his rescue as Mayor Prentiss begins a boyhunt and leads an army of angry men after him. It's harsh and cruel and addictive. This is The Fugative for teens and its tough and hard. It is beautifully written, a fantastic, grim, relentless story of a boy becoming a man in the most extreme, hostile environment possible. His life is turned upside down and absolutely nothing he knows for sure is real or true and that the hardest thing to discover. Each character is finely drawn, the language is rich and switching between thought and speech and Noise is a fantastic literary achievement. �It�s a girl," I say again. I�m, still catching my breath. Still feeling the pressure on my chest, definitely still holding the knife way out in front of me. Read this then tell others. They will soon be converted to the truth.